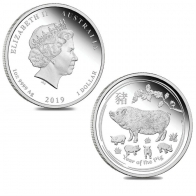 2019 BU St. Helena Spade Guinea Silver Bullion Coin. Beautiful brand new St. Helena Spade Guinea coins in brilliant uncirculated Condition. This coin was initially issued in 2018, and is currently available only in silver in 1 Oz size. 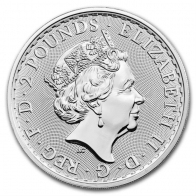 The front of the coin features an image of Queen Elizabeth II. Surrounding her portrait are the coin's year of minting, its face value, and the words 'The East India Company'. Each 1 ounce silver Spade Guinea coin has a face value of 1 GBP. The reverse of the coin features an image the design of a Spade Guinea shield. The coin's design is based on the original British Royal Arms image that was used on the coin's issued by the government of St. Guinea in 1787. Each silver Spade Guinea coin has a fineness of 999. These newly released coins have quickly become a popular choice for silver coin investors. The coins are available individually, or in a monster box of 400 pieces. Coins also come in tubes of 20 pieces. If you have silver spade Guinea coins that you would like to sell, please contact us. 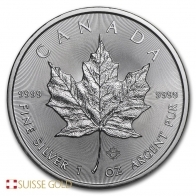 View the current silver price per ounce here.